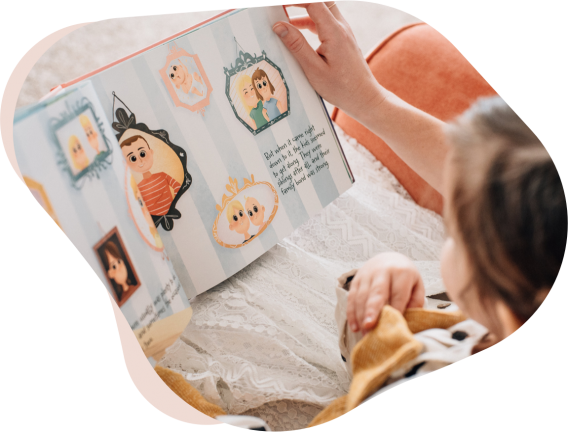 Create a personalized book to tell your children the story of a family member. Every book is packed with fun stories your family will treasure. Every story is a unique masterpiece. Because every person's life is filled with different events and adventures no two books will ever be the same. Tell us about the star of the book and we will turn them into your child's new favorite hero! Pick a parent, grandparent or distant ancestor. We want this to be as effortless as possible, so we'll take care of the writing and illustrations. Once you have shared with us the details of our story, we begin building your book. Memorialize the life of your loved ones as a timeless keepsake. Your children, mother, father, grandparents, family and friends will all cherish this book for a lifetime. Meet one of our in-house storytelling specialists. We'll spend 15 minutes getting to know the loved one you'd like to make your book about. We'll design and write your custom children's book with our team of illustrators an creatives. Within a week we'll send you a proof pdf of your custom children's book to approve before we send to the printers. We'll even work with you on edits and changes you'd like to make. Name of Book Character Who will the book be about? Follow the three simple steps below to begin making your FourBears Book today! Helping children understand their family narrative has proven to give them increased emotional wellness and a greater sense of belonging.